For organizations that provide Medicaid-funded personal care services and home health care services, Electronic Visit Verification (EVV) is a requirement, not an option. Without an automated solution for EVV compliance, agencies have limited or delayed access to care delivery information – increasing the risk of late payments, audit, or even claims denial. Collecting required EVV information is only part of the challenge. Agencies must also match EVV data to other required data in their system of record, and then accurately transmit that information to the state data aggregator or MCO who uses it for EVV monitoring, claims processing, and regulatory compliance. When agencies operate across states or must report to multiple MCOs, the complexity of the challenge quickly escalates. In this complex environment, agencies that don’t automate will be burdened by multiple workflows for disparate systems and potentially saddled with manual data entry tasks – a painful, inefficient, and error-prone way to comply with new regulations. Agencies that try to automate on their own will be required to build and maintain separate interfaces to multiple entities who monitor EVV compliance, and solve the problem of gathering data from many sources to comply. Furthermore, if the required data is not properly matched with EVV information, payment may be delayed, claims may be denied, and agencies may increase the risk of audit. We offer a better approach: CellTrak EVVLink. This single interface joins and relays EVV and other mandated information to streamline regulatory compliance and care management reporting. 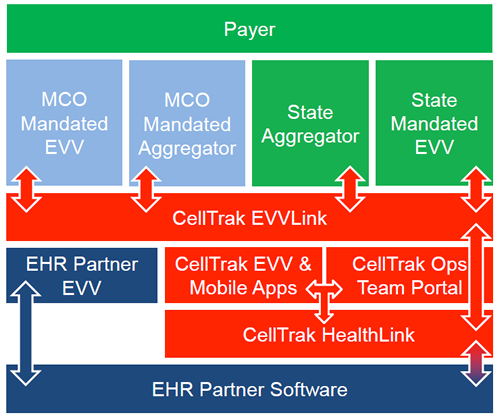 CellTrak EVVLink seamlessly transmits required information to state aggregators and MCOs who use it for EVV monitoring, claims processing, and regulatory compliance. CellTrak helps agencies get paid faster, with lower audit risk. The 21st Century Cures Act has established January 1, 2019, as the deadline for states to implement an EVV system for Medicaid-funded personal care services. CellTrak EVVLink can transmit required information to any entity – or to multiple entities as needed. This streamlines reporting workflows, particularly for organizations that operate in multiple states. 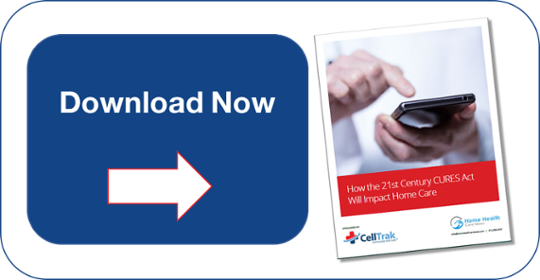 To understand how the 21st Century Cures Act impacts your organization, download our white paper today. How does CellTrak EVVLink work? When the data is joined, CellTrak EVVLink checks each record, and uses exception alerts to prompt the agency to review records which contain incorrect information – before any information is relayed. These exception alerts can signal errors such as invalid SSNs, invalid Medicaid IDs, or missing program codes, and enable the agency to correct them quickly. CellTrak EVVLink then transmits this data in the correct format to any entity, such as State Medicaid Agencies, EVV data aggregators, or MCOs. As a result, agencies are fully compliant with EVV requirements for reimbursement, setting the stage for faster payments and reducing the risk of phantom billing.